The annual Construct Canada will be held December 2 to 4 at the Metro Toronto Convention Centre (MTCC). The tradeshow is a major component of The Buildings Show—one of the continent’s largest exposition, networking, and educational events for the design, construction, and real estate communities. Ontario’s Credit Valley Conservation (CVC) has released four case studies and an interactive map demonstrating innovations in stormwater management. CVC is a conservation authority organization focused on preserving the province’s water, land, and natural habitats through watershed-based programs. 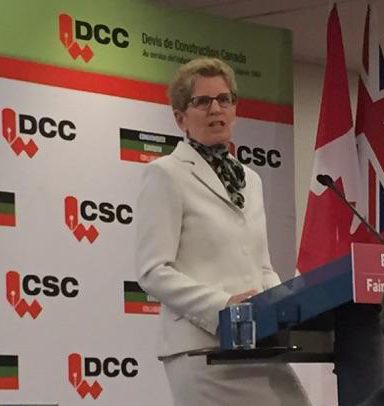 Last week, at CSC Toronto Chapter’s No Frills Trade Show, the Ontario premier spoke about the importance of new construction and rehabilitation of the province’s infrastructure to the economy. She discussed construction of schools, healthcare buildings, highways, and transit from across Ontario, along with the thoughtful “legacy” approach to Toronto’s facilities for the 2015 Pan Am & Parapan American Games, which will be repurposed as housing after the sporting event later this year. In addition to discussing the importance of better linking education, skilled trades, and employment opportunities, Wynne focused on the need for new built environment infrastructure to improve the provincial economy, productivity, and quality of life. She drew on recent experiences in China where she saw super-fast trains that cut lengthy commutes and bridged communities. This led to a discussion on the need for financial resources to improve infrastructure—funding not only from the federal government, but also via international investment and public-private partnership (P3) mechanisms. “We’ve got bridges, roads, and water systems that need attention, but we also know building new is critical,” Wynne said. This was the 37th annual No Frills event, which is referred to as the longest-running construction trade show in the city (though organizers speculated it could well be the province or country). In addition to the keynote lunch and expo hall, it featured product demonstrations, technical seminars, and an introduction to specifications discussion, geared toward students. For more information, visit www.csctradeshow.com.